These posts are licensed under the GNU Free Documentation License. They mostly use material from Wikipedia. The Gila monster (Heloderma suspectum) is one of the two known species of venomous lizards. (The other is the Mexican beaded lizard.) The Gila (pronounced heela) monster lives in the deserts of the southwestern USA and northwestern Mexico. It is a heavy, slow moving lizard, up to 60 cm (2 feet) long. Its skin has the appearance of beads in the colours black, pink, orange, and yellow, laid down in intricate patterns across the animal's body. Unlike a snake, the Gila monster envenomates its victim not by means of hollow teeth, but through grooves in the teeth of its lower jaw. It produces only small quantities of the neurotoxic venom, which is secreted into the lizard's saliva. By chewing its prey, however, it tries to put as much of the poison into the bloodstream of its victim as possible. 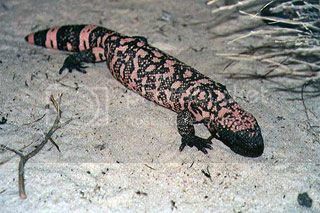 The Gila monster's bite is normally not fatal to humans (there are no reliable reports of fatalities), but it can bite quickly and is known to hold on strongly. The name "Gila monster" refers to the Gila River Basin in Arizona. In 2005 the Food and Drug Administration of the United States approved a drug for the management of Type 2 diabetes, Byetta (exenatide), a synthetic version of a protein derived from the Gila monster's saliva. Im a california native, and have lived in the deserts here, and I have never seen a Gilia Monster anywhere in the deserts, both low and high deserts, I have seen and encounter more diamond backs rattlers and the red tail mexican scropian, but never in all of my life ever seen a Gila Monster. unless I go to the Zoo. I would like to say though, is once back in the sixies and early seventies, the Horn-toed lizard (also known as the Horny Toed) used to be plentyful, now they are not where to be found, the same also hold's true for the California Desert Tortist, these use to be plentiful, and now they are on the endanger list, and Bush the president had open up one of the protected areas to off roaders where these amazing animals lives. And Bush is financed by corporations, so what else do we have to expect from him? What a crook. Descriptions of endangered animal species that are on the verge of extinction and that you most likely didn't even know existed in the first place. Updated more or less daily.